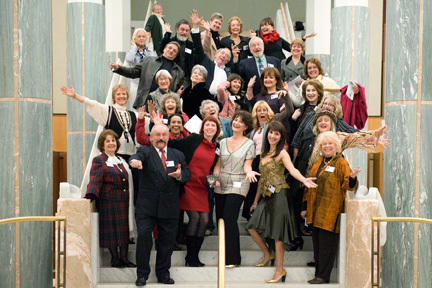 2009 – The artists on the staircase of Federal Parliament House in Canberra, at the opening of “Unsung Heroes” – photo Craig Peihope. Portrait Artists Australia was a national association of professional artists, active during the years 2002-2014, dedicated to representing and promoting the art of portraiture in Australia and overseas. Portrait Artists Australia was listed as an incorporated, non-profit organisation, registered with Fair Trading. In addition to showcasing the work of the 100 members in 30 exhibitions in Australia and in the USA, PAA held some spectacular fundraising art events for charities. This website is both a history of the non-profit organisation 2002-2014, and a continuing, active database of the members and their current activities. Our membership included established artists as well as emerging artists, and if you browse our website you will find realist, naturalist, surrealist and expressionist styles in all visual media, including oils, watercolour, drawing and sculpture. In addition to portraiture, the artists work in other genres such as landscape, figurative and abstract. 2005 – the Dome restaurant at the Arthouse Hotel – with some of the paintings of the exhibition “Fur and Feathers”. PAA members are strongly represented in selections for the annual portrait competitions: The Archibald; The Portia Geach; The Doug Moran; The Shirley Hannan; Perth City Black Swan prize – as well as regional prize exhibitions and other genre shows: landscape, figurative and abstract. Several members are listed on the Historical Memorials Committee Register, eligible for commissions of parliamentary portraits. Several are represented in the National Portrait Gallery in Canberra. Several have received awards in International shows in the US and Europe. 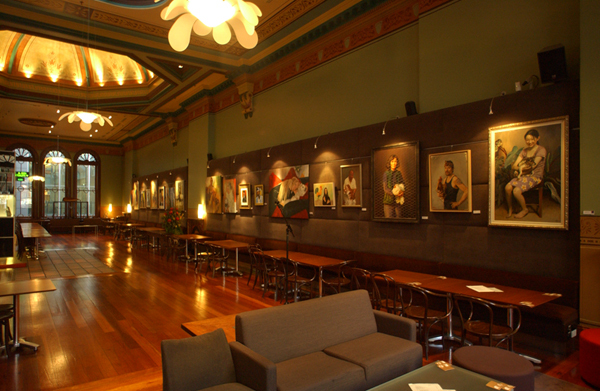 After the Launch in October 2002 by patron Andrew Sayers, (then Director of the National Portrait Gallery, Canberra), PAA held around thirty exhibitions – in the award-winning venue the ArtHouse Hotel, 275 Pitt St, Sydney, and in other public venues including the Supreme Court Building, Sydney (2006) NSW Parliament House, Sydney (2007,2009,2011, 2013) Federal Parliament House, Canberra (2009); The Victorian Art Society Galleries, Melbourne (2011, 2014). In May 2005 we held our first international exhibition: “The Macquarie International Portrait Artists Australia Exhibition” of 30 selected paintings was officially opened at the Embassy of Australia in Washington D.C. by Mark Pachter, Director of the National Portrait Gallery, Washington. In July-September 2014 we held our second international exhibition of 23 selected paintings at the Embassy of Australia in Washington DC. 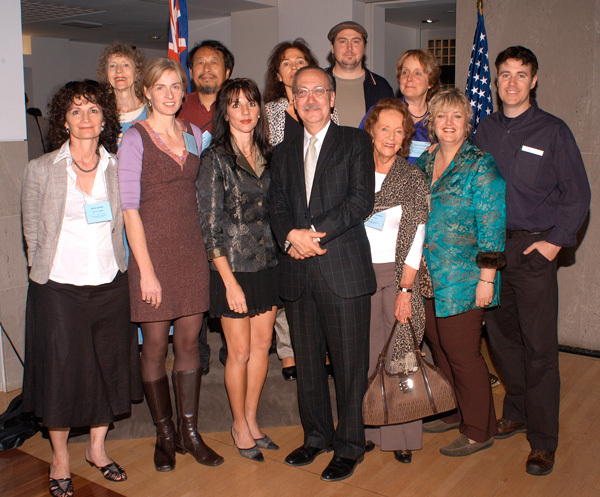 The 2005 opening of the “PAA International Macquarie Exhibition” at the Embassy of Australia in Washington DC. L to R – FRONT ROW Janis Lander, Embassy staff, Nafisa Naomi, Marc Pachter, Director of the National Portrait Gallery in Washington, Constance Farquharson, Robyn Ross, Paul Newton. L-R BACK ROW- Julie Ballis, Jiawei Shen, Yoli Salmona, Evert Ploeg, Kerry McInnis. Our Opening Nights were hugely popular and attracted some fascinating guest speakers – including Her Excellency Professor Marie Bashir AC, Governor of New South Wales; art historian Professor Sasha Grishin; Mark Pachter (Director of the National Portrait Gallery, Washington DC); Ron Ramsey (the US Australian Cultural Ambassador); US Consul General, Mr. Stephen Smith; Andrew Sayers; Hon. Peter Collins; Hon. Peter Debnam; architect and gallery director Simon Chan; art collectors John Schaeffer, Roddy Meagher and Pat Corrigan; Paul Delprat (artist and Director of the Julian Ashton Art School). TV personalities John Mangos and Maria Venuti; actor John Wood, and writer and performer Jean Kittson. Portrait Artists Australia was the brainchild of artist Nafisa Naomi, who combines her artistic talent with entrepreneurial vision. A hardworking committee of artists was elected each year at the Annual General Meeting and together they organised the exhibitions and events over the 12 years. The PAA LOGO was originally designed by Jules Sevelson in 2003, and upgraded by him in 2010. The current website was designed by Kathrin Longhurst in 2008 and she has acted as PAA Webmaster since then. Judith Stevens, who owns the famous Beat Street Dancewear in Sydney, generously served as PAA’s Honorary Secretary 2004-2014, taking over the role from Melissa Beowulf. Sally Robinson designed both of our international catalogues, many of our later invitations, and advertising material for Art publications. Janis Lander acted throughout the 12 years as Communications Officer and wrote the Newsletters, formal correspondence, and other promotional literature. Jeanette Korduba arranged sponsored printing for the newsletters and catalogues, and occasionally provided exhibition photography for the website. The executive team was elected each year by the committee. The Executive team was responsible for organising all our events. Nafisa Naomi was President from 2002 until 2005, with Paul Newton as Vice President from 2002-2004 and Robyn Ross as Vice President from 2004-2005. From 2005-2007 Robyn Ross acted as President with Nafisa Naomi as VP. In 2008 Nafisa Naomi was again President with Janis Lander as Vice President. In 2009 Janis Lander was elected President and remained in this role until 2014. Kathrin Longhurst was Vice-President 2009-2012. Jeanette Korduba was Vice-President 2012-2014. Nafisa Naomi and Robin Ross jointly organised the 2003 Gala Black-Tie Dinner, at the ArtHouse Hotel, which raised $50,000 in support of Legacy: Jan Williamson and Paul Newton both executed portraits of decorated war heroeswhich they donated for the event’s Auction. Sally Robinson designed the catalogue for the 2005 Washington exhibition, and also worked on the 2012 publication The Artists’ Book, celebrating ten years of PAA. Sally currently designs our exhibition invitations and catalogues, and our ads in Art Magazines. Many of our artists actively support charity events and auctions such as: The Humane Society; Genes for Jeans; Chairs For Charity; The Humpty Dumpty Foundation; The Northcott Society’s Beaux Arts Ball Charity Auction; The Fischer Road Special School; The Children’s Hospital Randwick; The Westmead Children’s Hospital; Animal Works; The Bezalel Foundation, and many other fundraising events. Our Patrons: Andrew Sayers remained our Patron until he left the National Portrait Gallery in 2009. 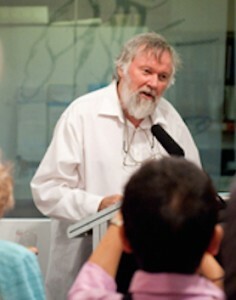 Edmund Capon, Director of the Art Gallery of New South Wales was our Patron until he resigned from the AGNSW in 2010. Louise Doyle was our patron 2012-2013 while she was Director of the National Portrait Gallery. Paul Delprat (Artist, and Director of the Julian Ashton Art School), was our Patron and enthusiastic supporter 2002-2014, and we held our Annual General Meeting at the beautiful JAAS building at Headland Park in Mosman. We gratefully acknowledge Paul’s generosity in this capacity. 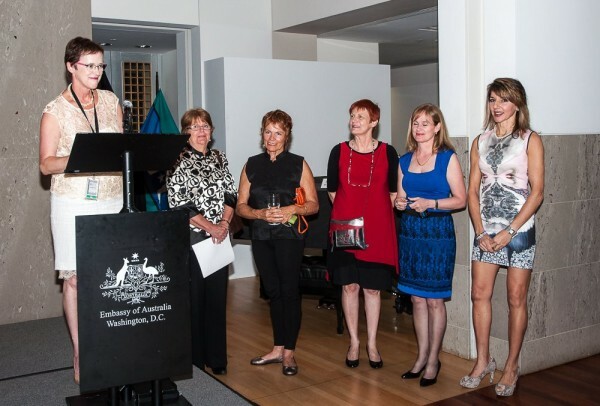 PAA acknowledges the generous support and sponsorship for different exhibitions and events from Macquarie; Shirley Hannan; The Nelson Meers Foundation and private patrons such as John Sample who sponsored our 2014 Washington DC exhibition. In addition – Photographer Craig Peihopa, whose photos are available to view and to purchase on the website; Paul Cartwright of Woollahra Art for interstate freight sponsorship; The Artscene; Bruce Thompson for donating printing of newsletters and catalogues; and Chris Muir who designed the 2010 invitations. In 2012 PAA released a limited edition of The Artists’ Book, Portrait Artists Australia – Ten Years. This coffee table book, commemorating ten years of the association, represented 87 artists with images of their work and a personal statement. The tone of the book is intimate and gives an insight into the artist’s process. The quality of the publication reflects the skills of Design Team – Kathrin Longhurst, Sally Robinson, Stephanie Brown, and editor Janis Lander all professionals in their respective fields. Some copies of the book may still be purchased from PAA directly or from Gallery Bookshops at the AGNSW and the NPG. As well as some donors who prefer to remain anonymous, we acknowledge numerous individuals and small businesses who have donated items and support for our auctions and fundraisers. The spouses and partners of the artists on the committee were always actively supportive, and we thank them with all our hearts. As of December 2014 Portrait Artists Australia closed exhibition activities, and closed our non-profit incorporated status. Portrait Artists Australia remains as an online network of professional artists. Please contact us using the ‘Contact” form on this website – if you cannot find the answers to your questions on the site. You can contact the artists directly via links on their pages. 2014 – Some of the exhibiting artists at the October opening of the Melbourne exhibition “Australians at Work”. 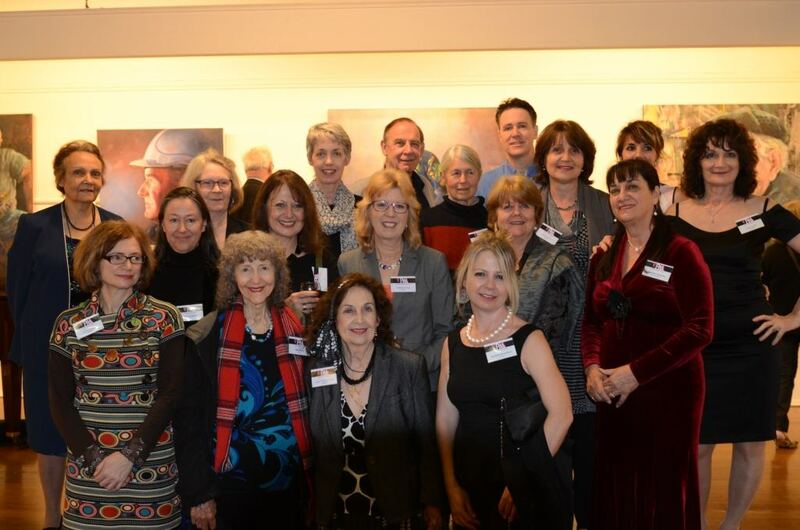 Held at the Victorian Artists Society Galleries in October 2014. L-R FRONT ROW – Irene Crusca, Julie Ballis, Judith O’Conal-Prinz, Jacqui Grantford, SECOND ROW-Vicki Sullivan, Doffy White, Raelene Sharp, Dee Jackson, Jeanette Korduba; THIRD ROW – Micheline Jones, Helen Edwards, Jacquie Blight, Coralie Armstrong,Regina Hona, Janis Lander. FOURTH ROW – Alan Somerville, Paul Newton, Nafisa Naomi.